Revisiting the work of early pop critics such as Richard Goldstein and Robert Christgau, Powers shows how they stood at the front lines of the mass culture debates, challenging old assumptions and hierarchies and offering pioneering political and social critiques of the music. Part of a college-educated generation of journalists, Voice critics explored connections between rock and contemporary intellectual trends such as postmodernism, identity politics, and critical theory. In so doing, they became important forerunners of the academic study of popular culture that would emerge during the 1970s. 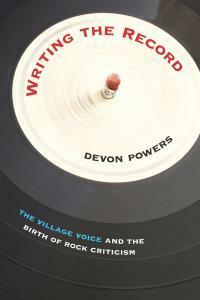 – Press release for Devon Powers’s upcoming tome, Writing the Record: The Village Voice and the Birth of Rock Criticism. Consider me stoked. Or anyway, intrigued.